Thank you to everyone who pre-ordered Pioneer Girl: The Annotated Autobiography from the South Dakota Historical Society Press. We are glad to say that the books will be arriving on your doorsteps in the next few days. 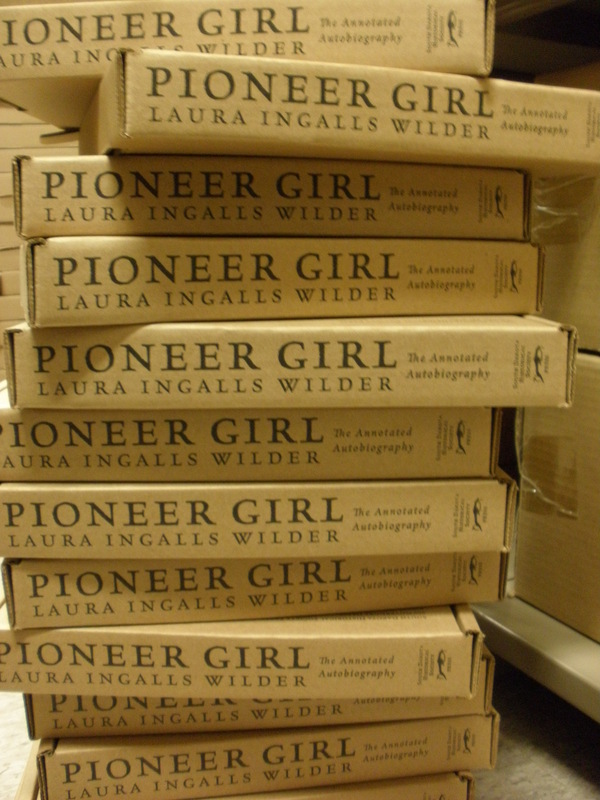 On Friday, November 14, the long-awaited Pioneer Girl: The Annotated Autobiography made it safely to our warehouse. As pallets of boxes were brought off the semitrailer, sod-house-like structures began to form and Press staffers Lisa Nold and Rodger Hartley quickly lost their sense of time and place. However, they soon gathered themselves in preparation for the big sendoff beginning November 17. That Monday, as if jolly ol’ Saint Nick himself were looking over our shoulders, box upon box was packed with care to be sent off across North America. The project of packing pallets to be shipped to our national and international distributors and bookstores had also begun. Boxes were hauled from one storage area to the next as our muscles protested the change from desk-work to dock-work. Yet, we can report that the work is done and the books are on their way to bookstores around the world. The pre-orders are stacked and ready to go. With Judy Thompson’s beautiful cover art, maps, photographs, and annotations all enhancing Wilder’s Pioneer Girl, we think the result is astounding. We hope you agree. 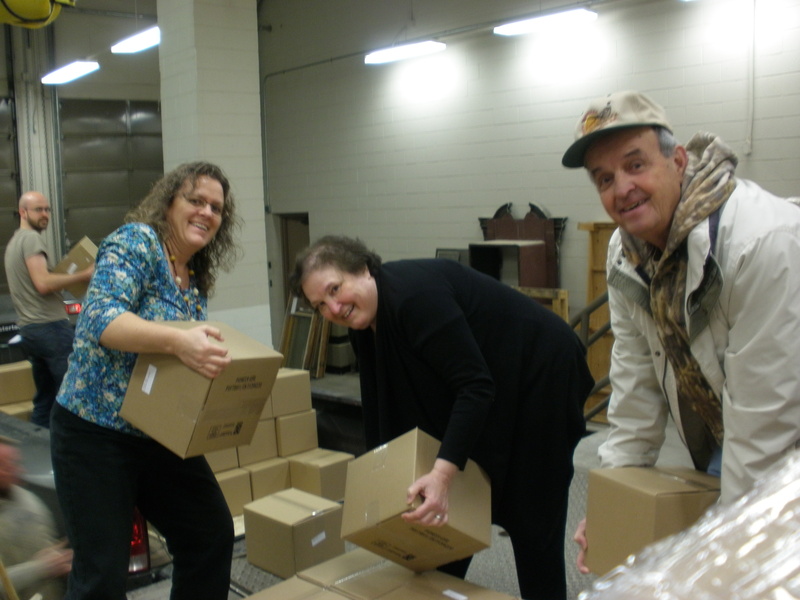 Everyone helped load boxes for the De Smet Memorial Society. Pioneer Girl: The Annotated Autobiography can still be ordered from the South Dakota Historical Society press for $39.95, plus shipping and tax. This entry was posted in Behind the Scenes, News Updates, Pioneer Girl, Pioneer Girl Project and tagged books, preorders by SDHSPress. Bookmark the permalink. Without further delay…PIONEER GIRL is here! (…and it’s Annotated…) Let the rousing discussions, debates, and reactions of knee-jerk-disbelief begin! I would love to say thank you to absolutely everyone there for their hard work and dedication. It makes my anticipation of the books arrival that much sweeter. This is a childhood dream realized for me and I appreciate everyone’s hard work! Thank you, Sherri. We hope you enjoy the book! Yes! I’ve had it ordered since August, and just returned my last library book, so my limited reading time can be allotted to LIW for the foreseeable future. Fantastic! So looking forward to receiving and reading! Excellent work to all those that were involved in the making of the project! I am sure that it was not an easy task at times. Thank you thank you!! I received my copy today. It is a beautiful book! I can’t wait to begin reading. Thank you all so much for all your hard work!! I’m so excited, I can’t wait for my copy to arrive!! Still waiting for mine to arrive! So excited and looking forward to loosing myself in this great book and sharing my thoughts with others. Is there any way to purchase this in stores, or on Amazon? Thank you for your question, Kate. The book was sent to distributors and retailers last week, 11/20-11/21. You can also order Pioneer Girl: The Annotated Autobiography through this website or by calling (605) 773-6009. I am so excited that I am planning to stalk to mail-carrier to ensure prompt delivery! Thanks for all your work. Received mine yesterday (I’m in CA). It’s gorgeous and much larger than I pictured it, even with your blog photos! Thank you!!! When I was 11, I ordered the first 15 photocopied pages of the Bye version of the original manuscript from the Herbert Hoover Museum. (15 pages was all I could afford at that time), and had them shipped to Pietermaritzburg, South Africa. 16 years later, I am excited to read the rest of Laura’s original story.